Quick heads up! CZARFACE By Concrete Jungle Studio artist proofs have just dropped online. Like we said previously back in June 2018. Here at TTC we also collect hip-hop records, in fact we are proud to have every Czarface’s release to date. For those of you who don’t know Czarface, we’re talking about a mythical group formed in 2013 by 7L & Esoteric and Wu-Tang Clan member Inspectah Deck. Following the brand new collaboration album with the one and only MF DOOM, ‘CZARFACE MEETS METALFACE’ a new exciting release is coming. Steven Cartoccio of Concrete Jungle Studio, the creator of the epic Frankpool, just to name one, now Steven is meddling with metal. 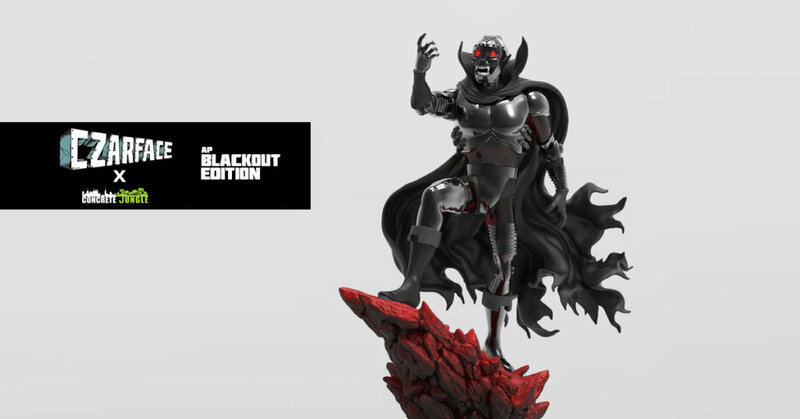 A full-sized resin figure featuring Czarface in all its glory! Now coming in a BLACKOUT edition, like they say once you go black you never go back, HA. Get Czarface’s album at getondown.com. Did you miss out on Stanley, Frankpool andMarkneto? Check them out below.